You can find expert Ramsey asphalt and pavement resurfacing when you pick up the phone and call (201) 327-5258 today. We will send an experienced crew to look at your asphalt surface and provide a cost-effective solution. Click here for valuable money-saving coupons. Over time, even the best asphalt installation will break down and require repairs or other modifications. Factors like people walking on the asphalt, vehicles driving on it, sunlight shining on it, rain and snow falling on it and wind blowing over it will weaken the structure, making it dangerous and unattractive. One option is to resurface the asphalt to enhance the aesthetic appeal and help extend its useful life. Find out what your neighbors think about our services when you click here now! 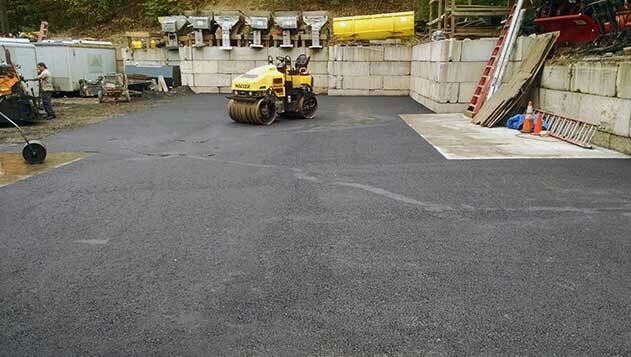 Unlike patching up holes and cracks, or applying a sealcoat to the asphalt, resurfacing is more of a structural repair, in that you are applying new asphalt over an existing driveway or surface. Resurfacing is also different from replacing the asphalt, because you aren’t removing the existing driveway first. It isn’t as long lasting or stable as a complete replacement, but it is more cost-effective and still provides a safe and attractive surface. Resurfacing is important because it covers up the flaws and potential safety hazards of the previous surface. It is a great option for those with smaller budgets who want to keep their pavement looking professional and keep it safe. It is important to note that pavement resurfacing won’t last as long as removing the old pavement and replacing it, but it is still a viable option. Many homeowners or business owners choose the DIY method for resurfacing their pavement, often with limited success. Although it looks like you’re just spreading some new asphalt over top of whatever is there, you still have to consider drainage and make sure it is level when you are finished. Professional contractors with experience resurfacing pavement have the experience and equipment required to do the job right the first time. Take a moment to consider the amount of traffic that walks and drives over your asphalt surface on a regular basis, and then remember a professional contractor that specializes in asphalt will be able to plan and prepare your resurfacing job to accommodate whatever traffic numbers you usually have. Professional service is like an insurance policy that gives you peace of mind it will be done correctly. If your asphalt surface isn’t looking the way it used to, and needs a boost, call McFarlane Asphalt at (201) 327-5258 in Ramsey, NJ and the surrounding area so we can book an appointment to resurface it for you.